One of my Ground Bologna sandwiches on white bread, on February 28, 2016. Yeah, I like them even thicker than this. There’s a deli/butcher shop in Burton, Michigan, called Nehring’s Market. We’re more than acquaintances with the Nehring’s as Ralph and his wife are my late younger sister Janet’s Godparents. Ralph and his crew of cutters make a Ground Bologna Sandwich Spread that tastes almost exactly like this recipe. This recipe is what my mom made for at least five decades. Somewhere down the line, we think mom’s recipe, and what the Nehring’s crew offers in the store, crossed paths and are, in fact, of the same lineage. A working bin of the spread at Nehring’s Market, December 30, 2008, in the middle of being transferred to the small tubs for sale in the case. This lunchtime and picnic favorite is available by the pound in some variation in just about every deli and butcher shop in the midwest. 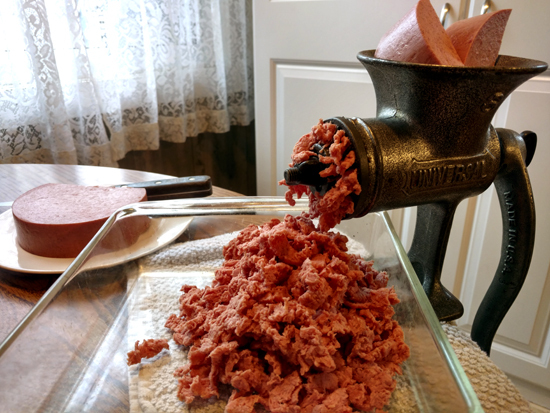 It’s simple to make: Kids absolutely love helping grind the bologna in the meat grinder. A lot of this recipe doesn’t actually need to be measured. This is one recipe you can make ingredient-by-ingredient, tasting as you go, creating your own flavor, and using different brands and various flavors of each of the ingredients. 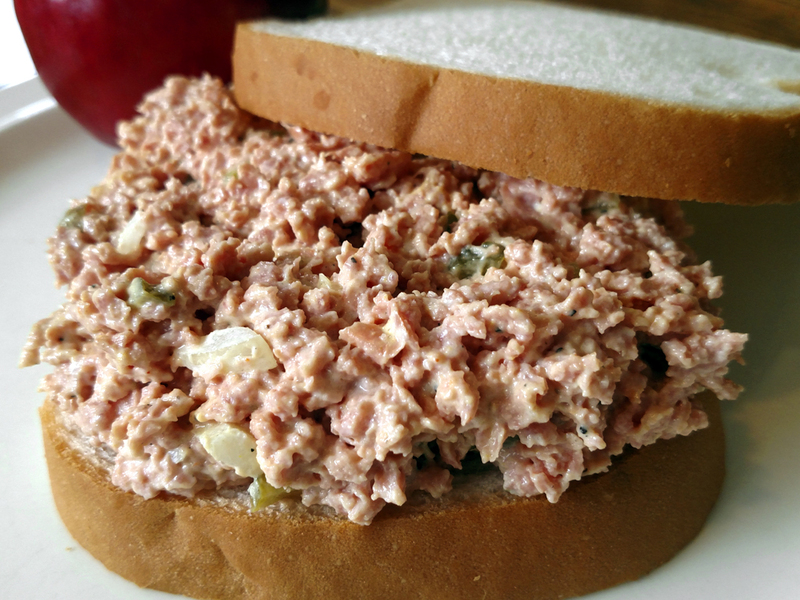 Ham Spread/Ham Salad: This seems a misnomer, as there’s certainly no ham in the recipe. But this appears to be similar to what Irma S. Rombauer called Mock Chicken Drumsticks (City Chicken) in the original versions of her Joy Of Cooking. The 1943 edition lists both pork and veal as ingredients, but no chicken. Many versions of City Chicken today only use pork. So a Ham Salad that contains bologna but no ham also makes sense. Bologna & Pickle Spread: But of course. Funeral Salad: So-named because in some areas it’s regularly served at wakes. Monkey Meat: This is mentioned in the comments, and Google users search for Monkey Meat and land on these types of recipes. I have no idea why it’s called this in some areas. But please, eat no monkeys. Ground bologna is much better. Regional variations on the recipe also include American or cheddar cheese, dill pickles, or chopped hard-boiled eggs. Historical Note: In chats with Hungry Christel up in Winnipeg, Manitoba, Canada, we believe the historical recipe this preparation came from is what’s called Fleischsalat. A simple staple in Germany that’s loosely translated as “meat salad”, it’s different from the similar preparation Wurstsalat or “sausage salad” in that Fleischsalat contains a German mayonnaise that’s mostly sunflower oil, among other differences. You can use a German ring bologna (aka “ringwurst”) for Fleischsalat, and you need to use a German pickle as well … but it’s the German delicatessan mayonnaise (there’s another style that’s a differenbt preparation) that you’ll find to be expensive. You can take the leap to make your own Leberkäse, which is a baked loaf of meat, to use instead of the ring bologna. It would also certainly be less expensive to make your own sunflower oil-based German mayonnaise. Be aware though that homemade mayonnaise only has a life of a couple days due to the use of raw eggs in its preparation. But remember, for authenticity German-style ingredients matter. 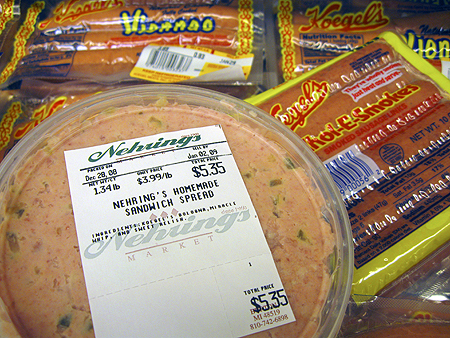 This is the real article here; Nehring’s Homemade Sandwich Spread, made with Koegel’s Bologna and photographed in Nehring’s own Koegel meat case. Of course, ya’ gotta have good meat. Finding the right ring bologna is an important step as it affects the flavor of the finished spread. 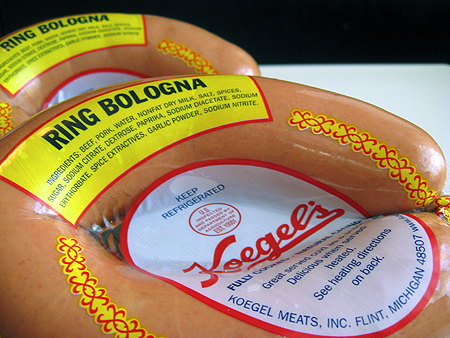 The most popular ring bologna, such as Ekrich and many others, have roots in the Pennsylvania Dutch communities. What you want to find is a good German ring bologna, as the Pennsylvania Dutch versions won’t taste the same whatsoever. Koegel’s Ring Bologna is the only stuff most home cooks use for this recipe. Albert Koegel was raised in the city of Durlach, Germany, in the late 1800s. When he was of age he joined one of Germany’s well-respected apprenticeship programs under the supervision of a Master Butcher. In a few years he had earned his Meister Wurstmacher designation, indicating he was a Master Sausagemaker. The product I use, shown below, is his own original recipe from the early 20th century. Find yourself a good local German meatpacker (there are many, such as at Alpine Village in Torrance, California) and use their ring bologna. Koegel ring bologna, one of the preferred products for this recipe. In the recipe below for Ground Bologna Sandwich Spread, I include a step about skinning the ring bologna before grinding it. However, the hot dogs in natural casings for the Homestyle Flint-Style Coney Sauce that I make regularly don’t get skinned before being sent through the same grinder. Unfortunately one day my brain swapped the two procedures. I made a batch of this spread for Mary and I … while only glancing at the recipe for ingredient amounts. As I was grinding the ring bologna, I noticed the ground bologna seemed to stay inside of the grinder more than usual. I thought maybe the disks on the front of the grinder were simply stuffed so, using a butter knife, I dug all the meat out of the disassembled grinder, then finished the batch of sandwich spread. The following day after eating sandwiches made from this batch for lunch, we had a good laugh (more Mary than myself as it was at my expense!) over having to dig large pieces of natural casing from each bite of our sandwiches. 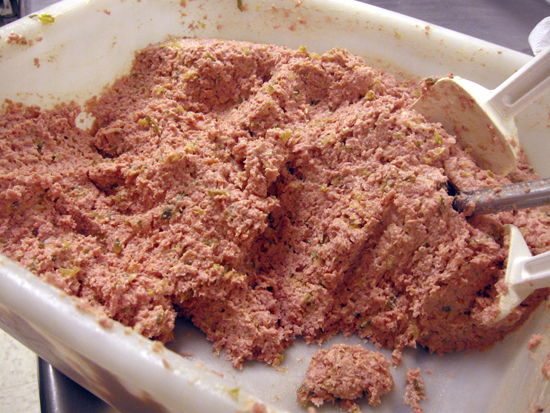 Chunks of Koegel bulk bologna from a 10-lb chubb, the other preferred bologna for use here. In January 2017 while visiting up north near Flint, and at Nehring’s Market itself while getting some ring bologna for this recipe, I asked for a couple lbs of beef bologna from a 10-lb chubb. I asked for it not to be sliced as I was planning on slicing it about 3/8″ thick, especially since I already had the ring bologna for the spread. The meat cutter looked at me strangely and, while holding the chubb of lunchmeat bologna, said “But this is what we use for the spread.” Ummm … what?? It turns out home cooks have likely used the ring bologna because it’s more readily available in most stores. (I’ve found Koegel’s ring bologna as far away as Lafayette, Indiana.) But the chubbs of beef bologna are generally only found in delis in Genesee County and surrounding areas, while grinding slices from the 1-lb packs is a royal pain. The only two commercial mayonnaise that are acceptable in this recipe. While using Hellmann’s for decades, we’ve switched to Duke’s for its extra creaminess and richness, and almost zero “twang”. Bulk bologna and ring bologna are spiced differently, so final seasoning of the resulting spreads will differ. Yellow onions aren’t as harsh as white onions, so we specify yellow. 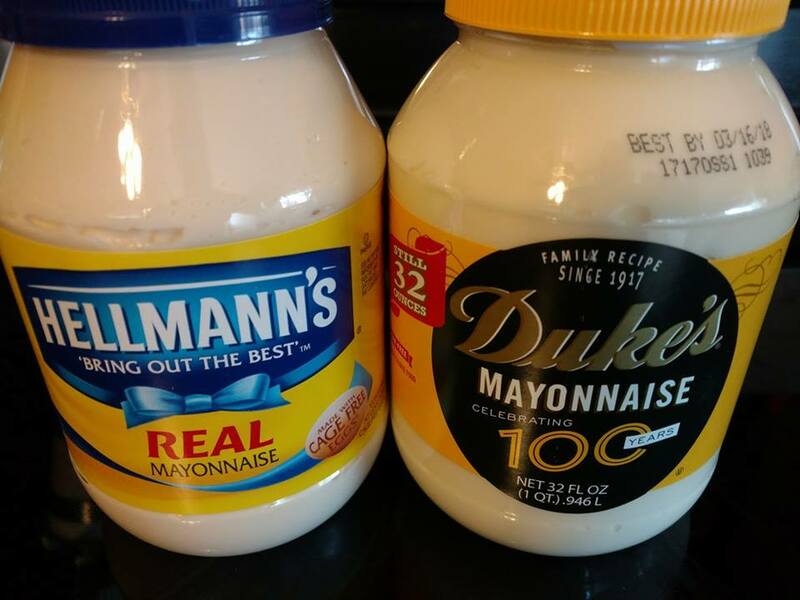 Duke’s Mayonnaise has a nicer flavor profile than Hellman’s, but as Duke’s can be difficult to find outside the south using less Hellman’s to get the same type of flavor and texture is fine. The best batch I’ve made so far uses Koegel bulk bologna, Duke’s Mayo, French’s yellow mustard, yellow onion, sweet gherkins, and no salt or pepper whatsoever. The original image for this post, circa 2008. Make all kinds of good stuff, and to enhance your reputation in the kitchen, make sure you can repeat it. And be sure that I will skin the ring bologna for the Ground Bologna Sandwich Spread from now on. If using ring bologna: Remove any strings or clips off the ends. Cut the bologna into 4 sections for easier handling. Slit one side of each section lengthwise and remove the casing. Install discs onto the front of the meat grinder for a fairly small grind and grind the bologna into the glass dish. After digging the rest of the bologna out of the grinder, dump the bologna into the mixing bowl. Finely-chop the sweet pickles till you have about 1/2 cup, and then do the same with the slices of onion. Add the chopped pickle and onion to the ground bologna in the mixing bowl, then add the mayonnaise and mustard and mix it all together till it’s smooth. Taste it, adding some salt and pepper to punch up the flavor if necessary. Transfer it to the storage bowl and refrigerate the spread until it’s ice cold. Use a fork to put a layer of spread about 3/8″ thick (my kids like it about 1/2″ thick on a slice of white bread, then close with another slice. Serve with kettle-cooked potato chips or steaming-hot French fries. Koegel’s bulk bologna from a 10-lb chubb or original-flavor ring bologna are the preferred choice. The garlic or pickled varieties also make for an interesting flavor. Other brands from other “real” German meat suppliers may be acceptable substitutes. While it’s possible to grind the bologna in a food processor, a better texture is created using an old-fashioned hand-driven meat grinder. These are available in specialty and antique shops, commercial food equipment dealers, and the cooking section of Cabela’s in Dundee, Michigan. Both Nehring’s Market and Grandma Joyce used Miracle Whip dressing instead of the mayonnaise. She also ground the pickles and onions through the grinder instead of chopping them separately. Grinding the pickles and onions also squeezes their juices into the ground bologna, which adds an interesting touch to the already tangy flavor of the Miracle Whip dressing. Oddly enough, she liked my version better, even though she insisted on using Miracle Whip for her own batches! Fall makes me crazy for the most love foods of my childhood. This isn’t the best idea because they are not the healthiest and I am always trying to cut back and control my weight. But it doesn’t do any good to deny myself a few meals of these foods. It passes eventually. My most recent craving is for sandwich spread. I went to a wonderful specialty market found in Highland Michigan, and bought a quarter pound of their German Bologna Spread to spice up my lunches at work. I got one taste and my husband got the rest! So…I went back for more, a 1 1/2 pound container and left specific instructions that I get at least 2 sandwiches with white bread and mayo and lettuce on it. Oh heaven! Then I tried to think of ways I could make it more healthy. My food co-op gets german bologna and hot dogs, all beef and no preservatives, and 100% Certified organic through a local farmer and we have had to go to ordering because everyone loves it so much. So I came looking for a receipe and found this blog. I am going to try this recipe, love it’s simplicity! Thanks for posting! My Mother would make this in the 1950’s when she and Daddy would put all four of us into the back seat of their yellow and white 1955 Chevy Impala and drive somewhere to have a picnic. She called them “Coney Island Sandwiches” and would bake a big batch of filled raisin cookies, prepare a bowl potato Salad and a large jug of lemonade. What a way to spend a nice spring or summer day on the weekend! I was looking online for some type of bolona spread recipe. Thank you! Like Mom’s. Perfect! Thank you. Add a small jar of pimento for color!! Here is my experience….I was going to slice some Beef Summer Sausage in my food processor. What happened was i put the slicing cutter in backwards and instead of slices, I got slivers. So I had 8oz of slivered or rough ground sausage. Do not wanting it go to waste I found this Bologna sandwich spread. But I changed the meat, and instead of Mayonnaise, I used cream cheese. And I added chopped black olives. I know it isn’t technically the same. It is however, very delicious! Thanks Gene, that sounds really good. There’s an older uncured Italian sausage called soppressata that would work great in such a recipe. I would also use kalamata olives in it as well, while keeping the cream cheese and maybe adding some chopped onion. You know, I’m going to have to make this now, thank you for the suggestion! I loved this as a kid at home! I forgot about this until recently and couldn’t recall how mom made this. Thanks Dave, for posting this! I’m going to make it again very soon! We just moved to the UP two years ago. One of the few things I miss about living downstate is Nehring’s Market. We lived 1/2 miles away. Such nice people and the food was lovely. I absolutely love ground bologna with all beef or ring bologna. Mom always said Best Foods or Hellmann mayo. I like a bit of Miracle Whip added too. Dill or sweet pickles. This recipe is just the way I remember. Thank you for sharing. Seems to be a Michigan thing. Grew up in Detroit area. Been thinking about making a batch of “cat’s meat” for a while now. Mom never used mustard or onions. Only bologna, mayo or miracle whip, and sweet pickle relish or gherkin pickles. Hi Ron … There seem to be a lot of possible variations out there, which is nice as personalizing recipes should always be encouraged. Pingback: Good Food Pittsburgh Radio Episode 1: "Holly Juice stay." This is also very good with real American cheese. I use 1 lb of bologna and 1/2 lb American cheese, sweet pickle relish, onion and Miracle Whip. So good, brings back memories of my childhood and almost tastes like my Mother’s!! My mom made ground bologna just like your grandma. Delicious. My question is this: we have a grinder, but have misplaced one of the rings (small one) that the meat is ground through. Where would one find a replacement ring? There is no manufacturer’s name on our grinder. Hi Doug … There are a few places online that are more informational when you’re looking for a replacement blade. One of these is One Stop Jerky Shop. Take a look at their Grinder Plates & Blades FAQ, then head over to their Plates & Blades page to order the right one. Growing up in Northeastern PA, several versions of this sandwich were a staple at birthday parties, church teas, & family gatherings. Bologna was always the main ingredient with either sweet or dill pickles. Mayonnaise Or miracle whip was added and soft, white bread was a must! We called them PM sandwiches, meaning pickles & meat or party meat because it wasn’t a party without it. Almost 70 years later, living in Ohio now, I’m met with strange looks when I serve it & most people won’t even try it. Their loss!! Thanks Jackie! I’ve now included PM Sandwiches in the list of names within the post, and added your explanation. Rix. Just asking. What about using dill instead of sweet relish. tedkorman, City Chicken is actually a staple in areas such as the Polish Village in Toledo, Ohio. I’ve found it prepped and ready-to-cook at local butcher shops, including House Of Meats. In his Iconic Recipes Cookbook Chef John Zehnder explains that the reason they chose chicken as their main dish early-on was that chicken was more expensive at that time, more a luxury item. I’m guessing City Chicken was developed simply because of how expensive chicken was at that time as well. I enjoy it myself, but we don’t have it too often. I grew up with this in Canton, OH .. and Mom would always have it in the frig when I would come back home when I lived in CA or FL. I had asked our local grocery store in Canton (Fisher’s) for the recipe but they claimed it was a “secret” .. really?!? Despite jeopardizing our national security .. I appreciate you sharing this “top secret” recipe .. thank you! Hi Mark … Because of a chef I used to build web sites for, I don’t believe any recipe should be “secret”. He release recipes constantly on his web site, and explained that while another Chef or Sous Chef could certainly get close, but would likely not hit his flavor profiles and textures exactly. They may get ingredients from the same suppliers, especially if they’re in a another restaurant kitchen nearby, but even if they get the exact same ingredients, their equipment and techniques are likely different from those he uses and specifies for use in his own kitchen. And with any experience at all, another Chef or cook not working for him would probably incorporate their own tastes anyway, whether they did so on-purpose, or inadvertently out of personal habit. That’s why people like myself just put recipes out there. I hope you have fun with this one. Our family always adds an egg or two, depending on how much we’re making. “Ham” salad was a staple of my childhood. I didn’t know until I was an adult that it was really made bologna! The bologna was ground up with an old-fashioned hand grinder. Mother added mayo and ground dill pickles. That was it! I could, and probably did, eat it with a fork right out of the mixing bowl. I grew up in Beloit, Wisconsin. My father was a policeman and didn’t make much money. 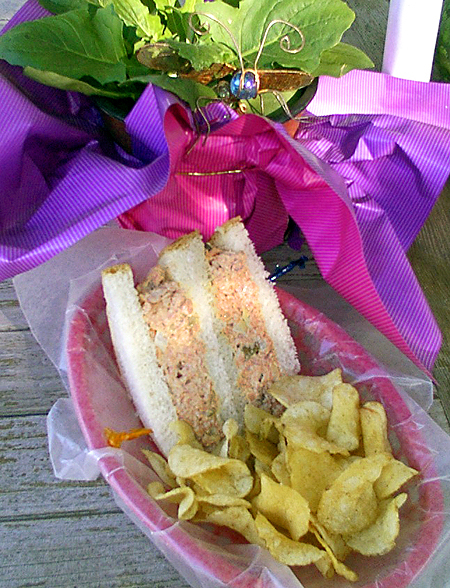 The “ham” salad was an inexpensive luncheon delight. Thanks for the memories! My family loved this spread back in the 1950’s, just like Jennifer mentioned in an earlier post. We had it for lunch at school and at work for my older brothers and Dad. I called my little sister to ask her if she recalled what all the ingredients were. She and I would grind the ingredients up in my Moms hand grinder so I was hoping she would remember, she suggested I look it up online. This recipe is very close to what my sister and I recall the ingredients to be. I will be making some to try it again, just for old times sake. I grew up in Rochester NY and my mom would serve this to her sewing circle gal pals. I loved helping her grind the meat up in that old hand crank grinder while sneaking chunks of ring bologna. She used a recipe from Good Housekeeping pamphlet cookbooks that you collected monthly and kept in a large green ring binder. Each pamphlet cookbook had a theme such as meats, vegetables, casseroles, baking, desserts, and party foods for those “June Cleaver” housewives. You can find the collection of recipe books sometimes in the original binder on ebay. My Mom used a similar recipe except no mustard and dill pickle, but also added ground lebanon bologna as well as regular bologna. I still make it with her old hand grinder!